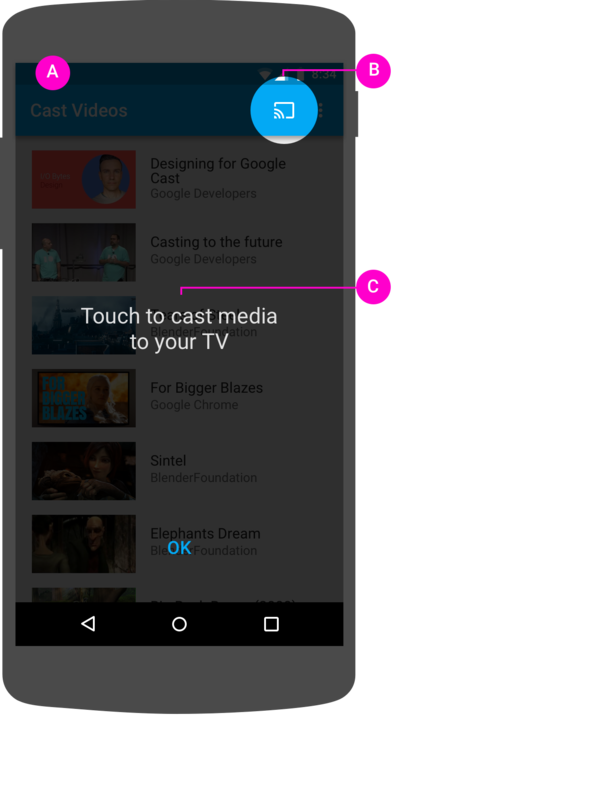 Introducing the cast button helps existing users know that the sender app now supports Casting and also helps users new to Google Cast. A When Cast receivers are available, the cast button must be visible from every screen in the sender app and located in a consistent position while browsing or playing content. 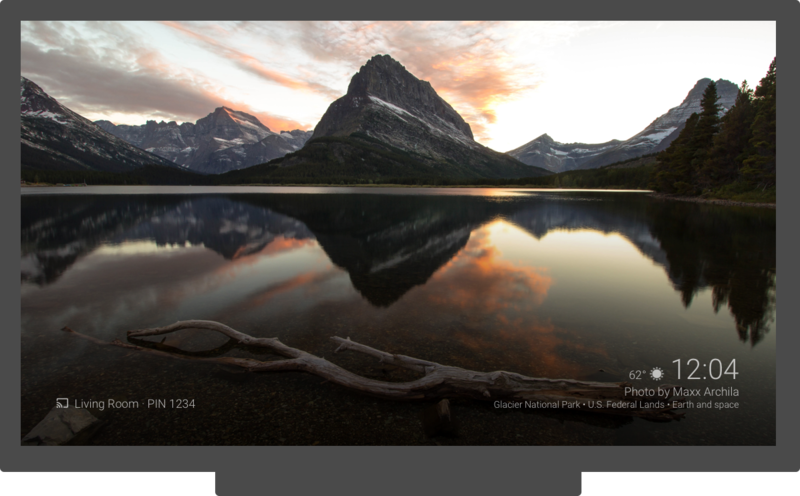 It will also appear in Chrome's header for global control. B In mobile apps, the cast button should be on the right side of the header. C In Chrome, the cast button should be on the right side in the content media controls (e.g. embedded video). If the media controls contain a fullscreen button, place the Cast button to the left of it. 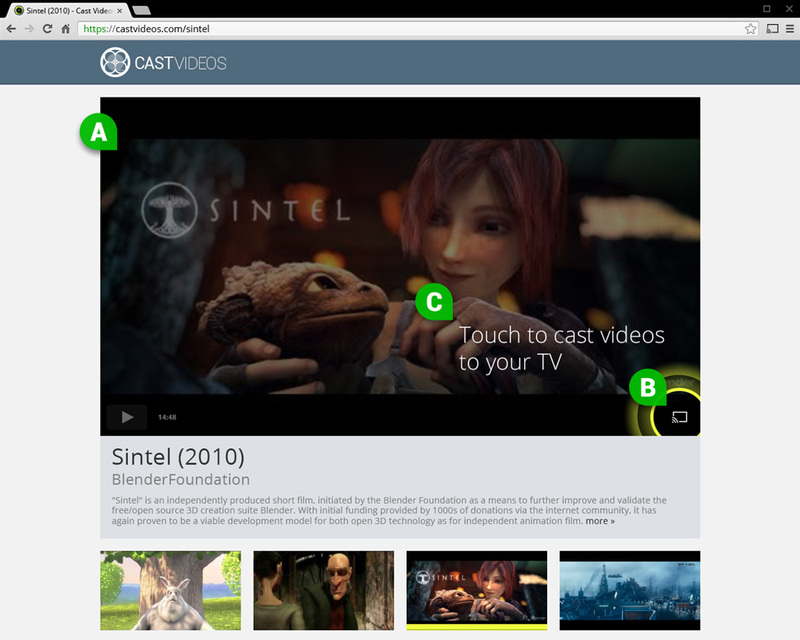 Google Cast employs a multi-tasking model, which allows users to browse the sender app and other apps while casting. 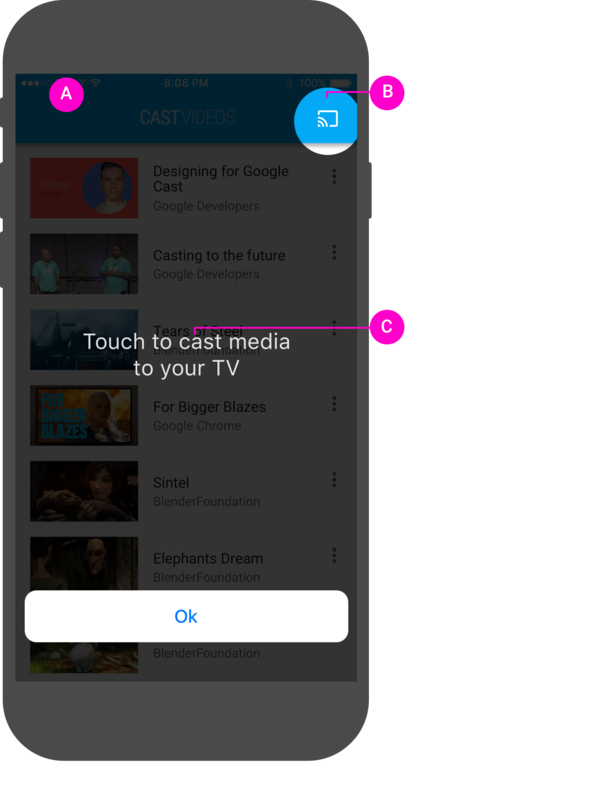 The Cast button must be visible from every screen of the sender app, so the user doesn’t have to hunt to find where to pause or stop the content playing on TV. In Chrome, the Cast button will automatically appear in Chrome's header if the user has the Cast extension installed. For each of the button states, use colors that match the style of other UI elements of your app. The Cast icon displays in Chrome to provide access to the Cast extension regardless of the availability of Cast devices. The Connecting (animated) state appears when the connection to the Cast API takes longer than expected (the Android and Chrome SDK's will automatically animate the Cast icon). Once connected, the receiver app launches. The ON / Connected state of the Cast icon has been updated and now uses a solid fill within the icon frame. Using a distinct highlight color for the ON / Connected state is now optional (e.g. yellow). The new cast icon and icon templates are available here. The Cast icon displays in Chrome to provide access to the Cast extension regardless of the connection state. Last updated April 28, 2016.